Imagine this - create a new event in your Google Calendar via Google talk or MSN Messenger. Or write a new post on your blog hosted on Blogger, Typepad or Wordpress using Yahoo! Messenger ? Well, you can do all these things and even without even launching the web browser - just add IMified to your favorite messenger software and you are ready to go. IMified is in open beta but if you visit their homepage, there's no link to sign up for the service. That's because this unique and very innovative service works completely inside your IM client like Yahoo!, MSN or Google Talk. Like twitter, you invite an email address (imified@imified.com or imified@gmail.com) via your IM and that immediately appears in your messenger's friend list. 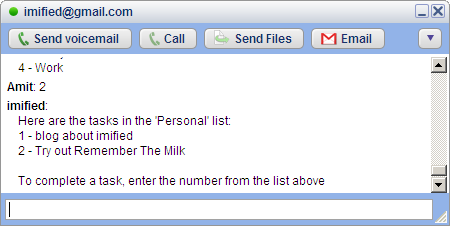 Once you setup the account, any text IM that you send to your new buddy, the message automatically gets added to the relevant service like Blogger, Google Calendar, BaseCamp Remember the Milk or 30 Boxes. There are two advantage of using imified - you get access to all services in one place plus things can be done really fast without having to wait for pages to load in your browser. And there's more - you can retrieve existing items from your TODO lists or calendars and even edit or delete them - right from your messenger. Imified can also be used from your mobile phone if you the IM software installed. Wish they add support for twitter and more online calendar services like Yahoo! and MSN.